While at the San Antonio Cocktail Conference last week, I had a chance to go to a special happy hour hosted by Desert Door, a desert spoon distillate, at the Havana Bar. I was interested in this company since I first heard about them, and since we first wrote about Texas made sotol. Just writing the words “Texas sotol” is fraught with all sorts of complications – there is an appellation (Denominación de Origen or DO in Spanish speaking countries) for sotol in Mexico, but it isn’t officially recognized by the US. 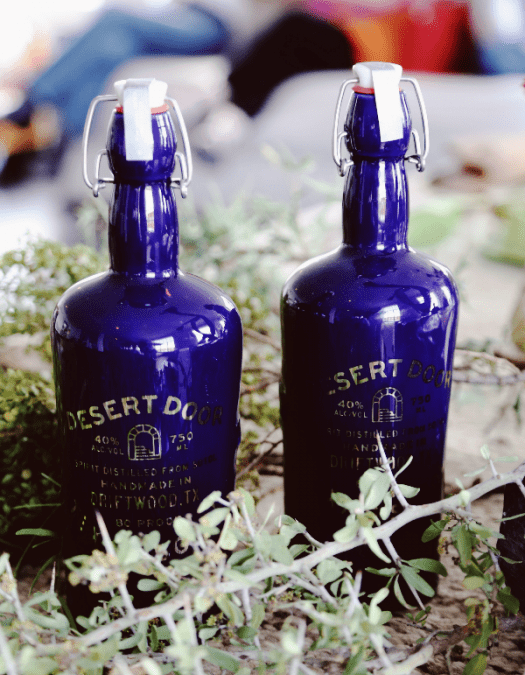 Desert Door is distilling the desert spoon, the Texas name for the Dasylirion plant from which sotol is made. If only it were an agave, then the problem would be easily solved by calling it a Destilado de Agave de Texas, but the desert spoon is not an agave, and calling Desert Door a sotol, begs the question, does a business honor a DO even if it legally doesn’t have to? But before diving deep into the politics of a name, let’s start with the Desert Door story. Founded roughly two years ago by Ryan Campbell, Brent Looby, and Judson Kauffman, the distillery is located in Driftwood, Texas. They work with ranchers who are more than happy to see their desert spoon plants used for a purpose beyond sitting on their property. If cut correctly, which is to say leaving the root system intact, the plant will regrow, which given the size of southern Texas, provides them with a steady supply for the foreseeable future. After harvesting, the leaves are cut from the around the piña, steam cooked, and then crushed to extract the juice, which is then placed in fermentation tanks with yeast (the strain was not identified when I asked), and then once done fermenting, distilled once. They have two expressions, theun-aged original clocks in at 40% ABV and the oak aged variant which is actually a higher proof at 50% ABV. The original had a very mineral, almost wet stone flavor neat, which was still prevalent when it was mixed into cocktails. The aged version was very smooth and still retained a hint of that mineral flavor. I would love to do a blind sotol tasting and think the final results would be interesting. It took two decades of negotiations, but finally, in 2005, the U.S. and the EU reached an agreement. In exchange for easing trade restrictions on wine, the American government agreed that California Champagne, Chablis, Sherry and a half-dozen other ‘semi-generic’ names would no longer appear on domestic wine labels – that is unless a producer was already using one of those names. I imagine the same will ultimately be true for sotol. If you want to get a bottle of Desert Spoon, you’ll have to head to Texas. Currently the company has no plans to extend outside of Texas, “It is the 10th largest economy in the world,” co-founder Brent Looby proudly told me. “True, but California is the fifth.” I responded with a smile. DO’s can be problematic and sotol is no different. Cultures don’t stop at borders- sotol has been traditionally produced in Sonora, and often in a mixed form. Sotol (the plant) is often mixed with lechugilla agaves- I have one right now in the backseat of my car from the mayors wife of San Pedro de la Cueva, and it is gooood. Traditionally it has been mixed with bacanora (A. pacifica/yaquiana)- rancher I was just at with a contingent from Tucson said in past they always added 1 or 2 sotols because they had a higher sugar content. This would be illegal now with the bacanora D.O. And I am probably importing a Sonoran sotol grown on a unique limestone setting- but- what to call it?